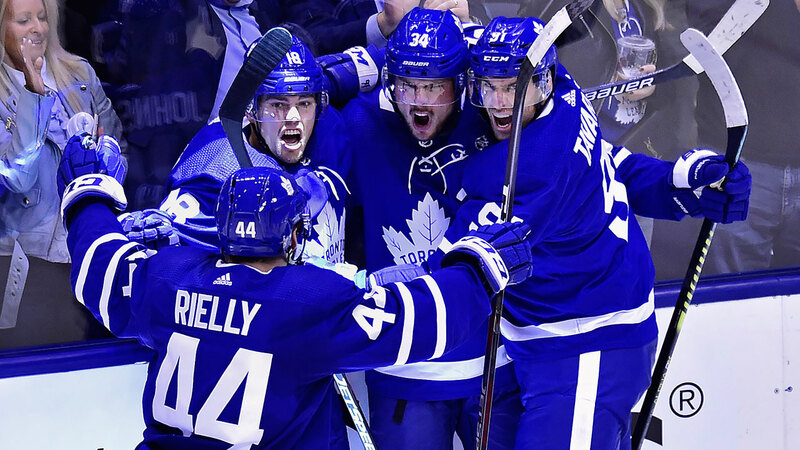 TORONTO — Back on familiar ice in the playoffs, the Toronto Maple Leafs protected their home-ice advantage with a 3-2 victory over the Boston Bruins. There was an expectant feeling in the air as Auston Matthews scored his first of the post-season and Frederik Andersen stopped 35 shots Monday to give Toronto a 2-1 lead in the best-of-seven series. This is the third straight spring the Leafs have qualified for the playoffs and they are attempting to capture the franchise’s first series win since 2004. Even playing without Nazem Kadri, who was suspended earlier Monday for the rest of the first round and watched from the Scotiabank Arena press box, there was a confidence to the way the Leafs managed the puck and put the Bruins on their heels with blazing speed. It was night and day from Game 2 in Boston, when the Bruins bullied their way to a 4-1 victory. After a first period tug-of-war on Monday, where the teams exchanged stretches of control, Trevor Moore opened the scoring 2:38 into the second period. The fourth-line winger jammed home a rebound from the side of the goal, giving Toronto its first 1-0 lead of the series. It lasted less than a minute. David Krejci tied it up after linemate Jake DeBrusk caused some ruckus in front, completing a sequence that began in the Bruins zone with a Krejci faceoff win over Andreas Johnsson after Matthews was kicked out of the dot. Still, Toronto kept up the pressure in a period where it finished with an 11-3 advantage in high-danger chances. Matthews scored at 10:12 after taking a Johnsson feed on the power play, breaking through on his 11th shot and 23rd attempt of the series and lifting a monkey off his back in the process. Johnsson extended the lead to 3-1 by going backhand roof after John Tavares won a puck battle behind the goal on another Leafs power play, but the building momentum was halted by a late holding call on Jake Muzzin. That allowed Charlie Coyle to get one back for Boston just 37.3 seconds before the second intermission. He found the puck in the high slot and beat Andersen high.